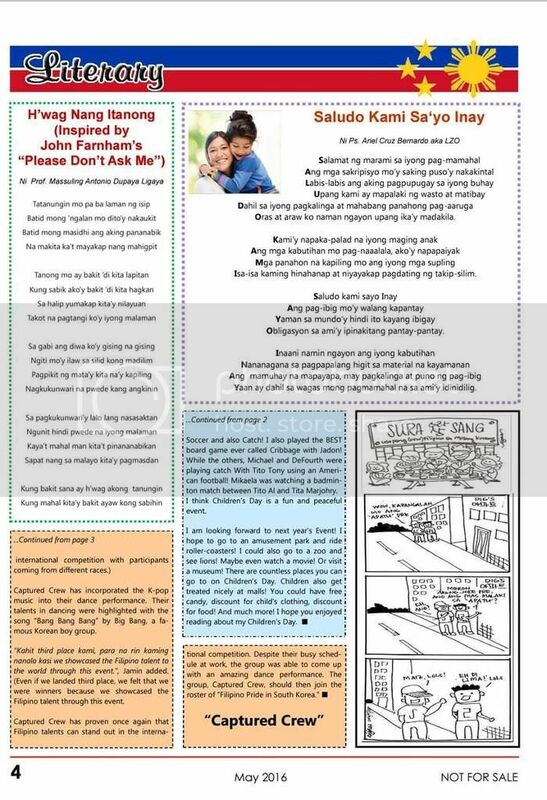 Sulyapinoy is a Filipino publication that comes out monthly for the Filipino community here in South Korea. 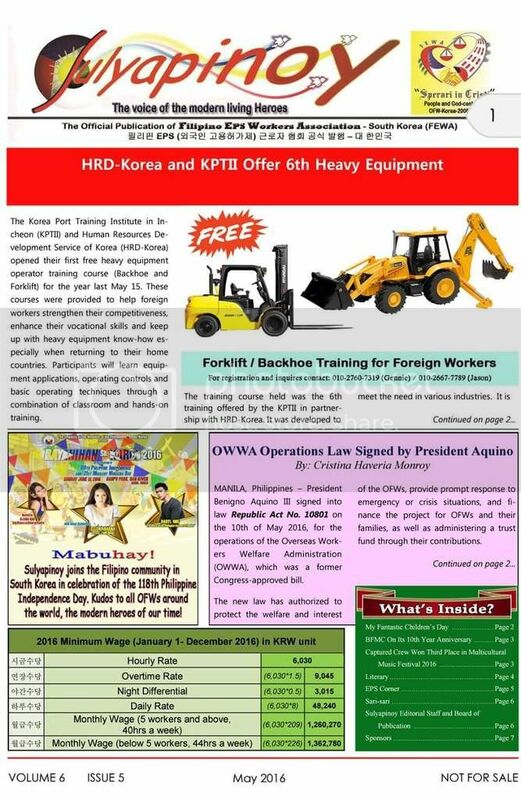 It is the official publication of the Filipino EPS Workers Association. But thanks to its Chairman of the Board and its Editor-in-Chief, my son had his first article published. LeRuof, my 9-year old Firstborn son, wrote about Children’s Day here in Korea (celebrated every May 5th) and how he celebrated it this year. Hello, my name is Lenaum Palomo. I am 9 years old. I am from the Philippines but I spent most of my life in Korea. I am studying at Dwight School Seoul as a 3rd grader. Im writing about my Children’s day in Korea. But first I am going to give you a brief introduction of children’s day in Korea. Children’s Day is about children and how the world needs them. It was founded by storyteller, Dr. Pang Chong Hwan in 1923 to instill a sense to children’s independence and national pride. It was first celebrated on May 1 until 1945. Long time ago it was called Boys Day until 1975 then it was changed to Children’s Day, as what we call it now. On Children’s Day, some movie theaters, amusement parks, museums and zoos have free admissions for children! In some parts of Korea, it’s just huge discounts. And I bet my mom would want to buy me millions of clothing on the holiday. The problem is that it is way TOO crowded because families are going left, right, and center buying stuff like clothes, doughnuts, movie tickets, ice cream, popcorn and much more! In the past few years, my mom’s friends were the ones giving gifts. We had parties. This year I celebrated Children’s Day by going to the park, having a picnic and playing with my friends, Michael, Mikaela, Jadon and my brother DeFourth. First Jadon came, and Michael and Mikaela followed but were late because they watched a movie. By the way, Michael and Mikaela are twins. I bet kids had a discounted ticket. We played Badminton, Soccer and also Catch! I also played the BEST board game ever called Cribbage with Jadon! While the others, Michael and DeFourth were playing catch With Tito Tony using an American football! Mikaela was watching a badminton match between Tito Al and Tita Marjohry. I think Children’s Day is a fun and peaceful event. I am looking forward to next year’s Event! I hope to go to an amusement park and ride roller-coasters! I could also go to a zoo and see lions! Maybe even watch a movie! Or visit a museum! There are countless places you can go to on Children’s Day. Children also get treated nicely at malls! You could have free candy, discount for child’s clothing, discount for food! And much more! 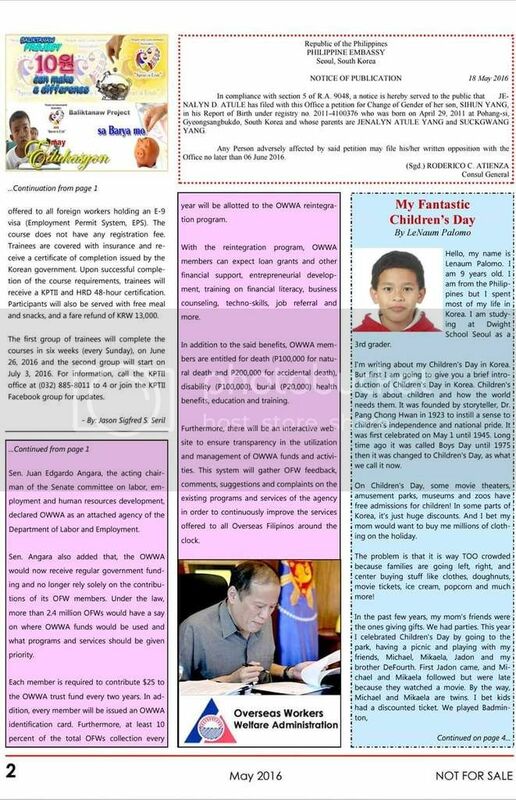 I hope you enjoyed reading about my Children’s Day. Looks like you’ve got another writer on your hands. Great job LaRuof! Keep up a great job and who knew that your community also has a publication. Thanks for the very encouraging feedback, Izzy. Thanks, Shirgie. I am excited to get a copy when we get back. Nagpa-reserve na lang ako. I didn’t have time to get one. I noticed you’re one of the staff of Sulyapinoy. Good job, Shirgie. That’s so exciting! Good for him 🙂 And it’s a lovely write-up of Children’s Day! What clear and concise writing. Your son has talent. Also, I learned about the origin of Children’s Day now. I’m glad it isn’t called Boys Day anymore. I also got to learn a little bit of Children’s Day history from him:-). What a fantastic and touching article! I’m so glad he got an article published and I hope he goes to an amusement park next year! Very impressive and intelligible writing. He has indeed started well, taking after you. I didn’t even know about the history of the Children’s Day in Korea but here is LeRouf giving us a succinct insight into this important holiday on the Korean Calendar. Please encourage him to write more. Xthanks for the encouragement, William! How cool! Would you look at that?! He’s following in his mother’s footsteps! Are you going to help him start a blog?! 🙂 That’s exciting, thanks for sharing. Hehehe, we’ll see. He isn’t exposed to any SNS yet, either.